The residency program began on July 1, 1973 at Kansas City General Hospital with three residents making it one of the first in the nation and the first to be endorsed by the Liaison Residency Endorsement Committee, a precursor organization to the Accreditation Council on Graduate Medical Education. In December 1976, the program moved into the brand new Truman Medical Center (TMC) which is still its primary site. At the time the ED had about 30 beds (configurations changed over the years) and 5 residents per year. TMC continues in the tradition of being the “safety net” hospital for adults in Kansas City, Missouri as well as being the primary teaching hospital for the UMKC School of Medicine. Across the street is Children’s Mercy Hospital, an affiliated hospital for the emergency medicine residency program, and tertiary care facility for the region’s pediatric population. About 2 miles away is Saint Luke’s Hospital, a large tertiary care private hospital housing the Mid-America Heart Institute. All three facilities are teaching hospitals for UMKC School of Medicine and Missouri State designated Level I trauma centers. In 2005, the TMC ED was completely remodeled into a 48 bed state-of-the-art facility with three trauma bays, a 7 bed urgent care area and a 128 slice CT scanner in the ED. 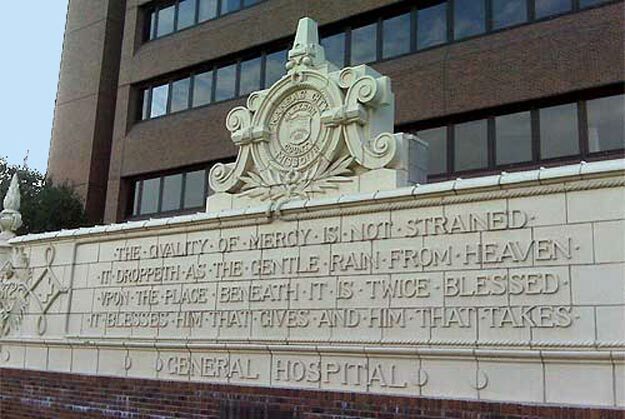 However, the mission of TMC has not changed and it is exemplified by the quote from Shakespeare which was originally over the door of “Old General Hospital” and is now displayed near the front door of TMC.